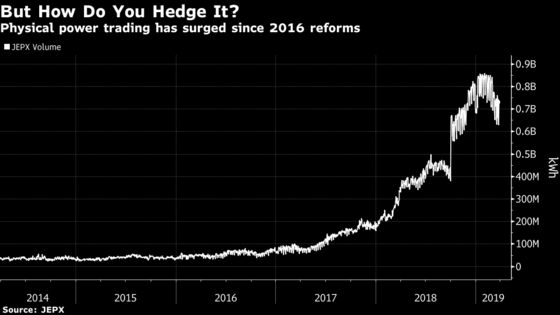 (Bloomberg) -- The new owner of the Tokyo Commodity Exchange wants to reinvigorate trading on the once-influential bourse after years of decline. It’s best chance may be new contracts in the nation’s fledgling power market. The buyer, the Japan Exchange Group, is perfectly placed to cash in on Japan’s burgeoning power market, where hunger is growing for derivatives to trade around the $133 billion sector that’s among the biggest in the world. Foreign firms specializing in electricity trading are seeking an opportunity to tap into its huge demand, which can swing across four distinct seasons, two interconnected grids and enormous fuel imports. Reforms led by the government of Prime Minister Shinzo Abe opened the electricity sector in 2016, instantly becoming one of the world’s biggest fully-liberalized power markets. While physical trade has boomed, a derivatives market failed to emerge, leaving retailers unable to hedge costs and overseas traders waiting on the sidelines. Japan dwarfs other traded power markets. It generated about 1,077 terawatt hours of electricity in 2017, compared to 240 terawatt hours in Australia and 324 terawatt hours in the U.K., according to BloombergNEF. At the same time, there has been an explosion of physical trading on the country’s power exchange. Roughly 30 percent of Japan’s electricity was purchased through the exchange so far in March, up from just 1.5 percent before the reforms. But the market still lacks derivatives linked to the power exchange. Tocom is still a long way from launching futures. The exchange has lacked support from the nation’s 10 regional utilities, who supply more than 80 percent of Japan’s electricity and are seen as key to making the market. Though the exchange had sought to bring on some of the regional utilities as founding members, none of them have said they plan to participate, according to a response to questions from Bloomberg News. The regional power providers benefited from a near-monopoly for about 50 years and have had little need to hedge since risks like fuel costs are automatically passed through to customers via a monthly adjustment system. The government’s plans to wind down that system as soon as April 2020 could spur further interest in futures. Tocom took a small yet concrete step Wednesday by applying for trial trading of power futures. Japanese news agency Jiji reported this week that the founding members will be new market entrants rather than utilities. Tocom declined Friday to say which companies are taking part. As the delays at Tocom dragged on, foreign exchanges looked for an opening. The European Energy Exchange AG, the world’s biggest bourse for power trading, announced in December that it was studying cleared futures in Japan. The exchange, known as EEX, hosted a meeting in Tokyo in March to gauge interest and workshop ideas for developing derivative products. About a hundred people attended the one-day event from a number of international companies including RWE AG, Total SA and Castleton Commodities International. Royal Dutch Shell Plc, which has ambitions to be a global power supplier, said in December that it set up a small desk to physically trade electricity in Japan, where it is in an “experimental” phase of learning to buy and sell power and identify industrial customers. About thirty companies -- mostly from the U.S. and Europe -- have explored entering Japanese market, according to Shoichiro Ishibashi, executive director of Astmax Trading, which provides over-the-counter services for power retailers. Trading has already begun between some parties using over-the-counter swaps, he said, referring to derivatives traded privately between two parties without going through an exchange. EEX is considering a start to clearing services for OTC derivatives as soon as next year.